So, Sheila, what's it REALLY like driving from place to place? Are you comfy? Is it fun? The answers to those two questions is yes it's comfy but remember there are some 5-6 hour days. Comfort only goes so far some days and a lot depends on the road. I'm sure CiCi needs shock adjustments which is on the list, but for now she is doing just fine. The comfort also comes with being able to get up and hit the bathroom or make a sandwich when you pull into a rest area. That in itself is a bonus. Is it fun? Yes it is. You live simply and get to see great places and small towns right from your own comfy chair. But..then there are the days where you may be tired and are in the "are we there?" mode. Then..you may have a moment like we did the other day on our way to a park. Before we left the park in Virginia it decided to just pour up along the area to where we were heading in Pennsylvania. We hoped it would stop but of course we drove in the rain. I had called our "go-to" campground in Pa. but it was full due to a huge car show in the area so we chose one in Gardners which was close by. Mountain Creek Campground. Mountain was the operative word here by the way! Our GPS has a tendency to take us on the "quick" route but in actuality, it's the longest. So now we are driving around twisty windy roads, but pros after California, except for the fog that blocked our view. I wish I could say it was the fog that had us driving on the narrow road right passed the campground, but it wasn't. Now what? It's not like we can do a u turn right there so we kept on driving. I spotted a church "house" that had a side area for parking and we turned in. I got out to help direct Roger for the turn around but had him turn instead too short and now was face to face with a tree and a ditch. Our dilemma now was that we can't back up because we have a tow dolly and car so after staring at each other for a few moments, we decided to take the car off and then take off the dolly. Did I mention that it was still raining? Photo of the entrance to the campground that we drove right by! I got into the car to start it and it didn't. While towing you tie off the steering wheel so it doesn't move but sometimes, with cars that you step on the break and push a button to start, that wrap that is holding the steering wheel will dislocate the mechanism. Thankfully this has happened before so it was an easy fix. And it's still raining. The car finally was off and the dolly unhitched and CiCiBlue turned the correct way. We hitched up the dolly and I followed Roger to the campground. We stay two nights and unwind while having coffee and watching the rain. No one was there until late the second day and it was heaven. This morning we got up around 6:30 A.M. so we could get on the road for an early start. It would be about a 5 hour drive and our goal was to get to the Pilot in Newburgh, NY in enough time to find a space for the night. Coffee made, poured and a few sips taken then we take the dogs out. I feed them then start the ritual of putting the chairs and a few other things on our bed so they don't roll around while we are moving. Roger is outside unhooking the hose and sewer connections then we meet back inside to bring in the slides. Slides in, now my job is to get the car back on the dolly. What they do while we work!!! The ramps are inside the car so I take them out and place them on the dolly so I can drive up and on!. It's been raining for days and the ground is soaked. Half way up the ramp it juts up and out of it's place and the car and I fall to the ground. Thankfully all is fine but with all the muck I have been walking through for days at this point I really don't care. I'm ready to turn into the Hulk and pick the car up and put it on there myself. Roger thankfully suggests that we drive up closer to where the office is and maybe the ground is harder there and it was! And we were off!!! After about 5-5 1/2 hours we arrived at the Pilot in Newburgh, NY for one night. We got here just in time as the truckers were coming in jockeying for a spot for a few hours rest or for the night. 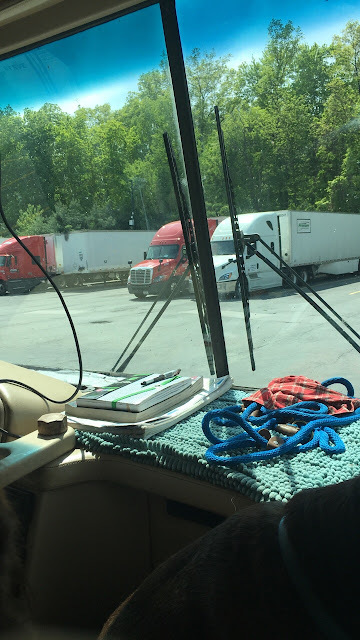 Pilot and Flying J both are RV friendly and welcome you to stay as long as you stay in your area and leave enough room for the truckers to pull in beside you. We keep our slides in and it's a submarine experience. Roger is an ex submariner and is quite at home in these close quarters and me? I'm adjusting. Lola? Not so much, she wants her under the bed spot. We stocked up on bottled water and Roger got two dark chocolate and "ahmond" dove bars so all is well. Tomorrow..New Hampshire until September!!! So that's a couple of days from the point A to point B. Not all days of travel are that dramatic and some are quite boring. We have our "time to go" ritual done to about a 1/2 hours time depending on how many sips of coffee I take. Our generator is running fine so not sure what that was that caused her to stop running, maybe a clog. Just all part of the adventure. Well, have a great evening. I'm going to try and find a spot to sit in. The boys have the couch and Lola is close to her "under the bed" spot . All is good and we are safe!